The process is vitally important in atmospheric physics and most people (including climatologists) do not really understand what happens and why. 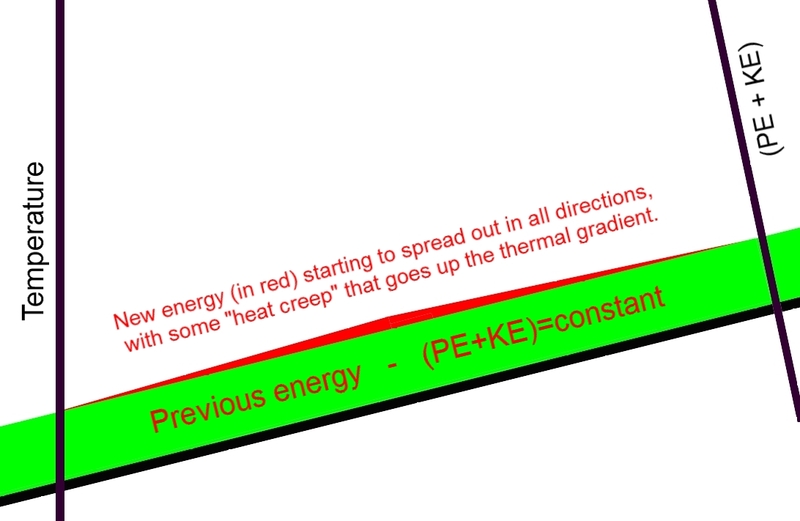 This is where the laws of physics come into it, and we need to understand that the Second Law of Thermodynamics controls all such heat transfers. That law tells us that, if there are unbalanced energy potentials in an isolated system, then there will be a propensity for those to vanish as the system approaches what is called "maximum entropy" and this is because that is the only way the system can go, always increasing entropy, assuming no new energy is added. ​However, a component of the energy in these "energy potentials" is gravitational potential energy, which is not affecting the temperature, because only the energy of motion (kinetic energy) does that. 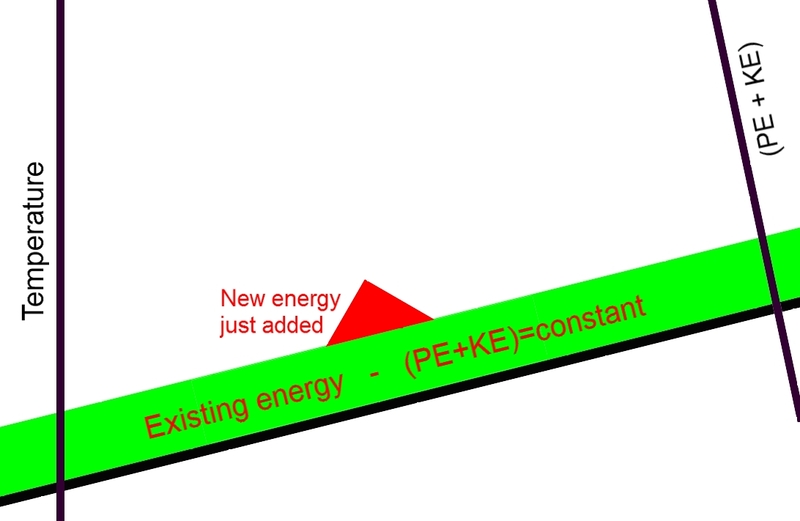 Now, as molecules move between collisions there will be an interchange of this potential energy and the kinetic energy, just as happens when you drop a stone to the ground and the initial potential energy is partly converted to kinetic energy. But temperature is a measure of the mean molecular kinetic energy, and so the temperature is affected in such a way that, when thermodynamic equilibrium is attained, we actually have a vertical temperature gradient which is cooler at the top. It is important to understand that this happens because the sum of kinetic energy and potential energy remains constant, just as it does when you drop that stone. So molecules at the top (with more potential energy) have less kinetic energy. Now the critical issue is what happens when the state of thermodynamic equilibrium is disturbed by, for example, the absorption of new thermal energy at higher altitudes only. What we find is that the new energy then spreads out in all directions away from the source of that energy. This is because there will be a propensity to reach a new state of thermodynamic equilibrium which will have a temperature profile with the same gradient but at a higher overall level. 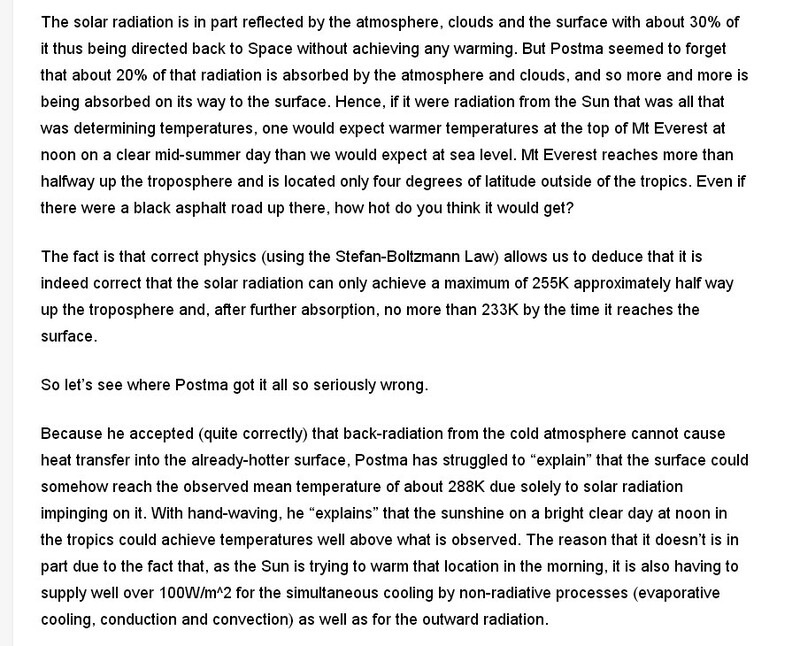 And that is how the required extra thermal energy (which James Hansen was looking for) gets into a planet's surface. But the temperature gradient is reduced in magnitude by radiating molecules such as in the so-called "greenhouse gases" like water vapor, carbon dioxide and methane. This is because inter-molecular radiation has a temperature leveling effect which works against the gravitationally induced gradient. We find that in moist regions the gradient is reduced by about a third, and so the whole plot of temperature against altitude rotates downwards at the surface end. 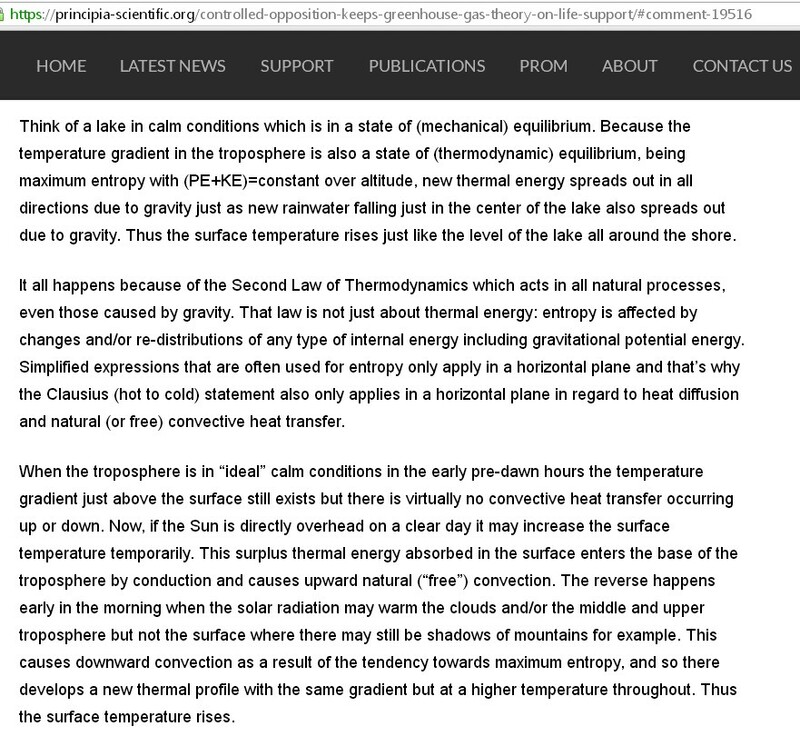 Hence these greenhouse gases lead to lower supported surface temperatures and not warmer ones. There is a study in the book which confirms that water vapor does in fact cool in the real world, and this single fact completely smashes the greenhouse conjecture. 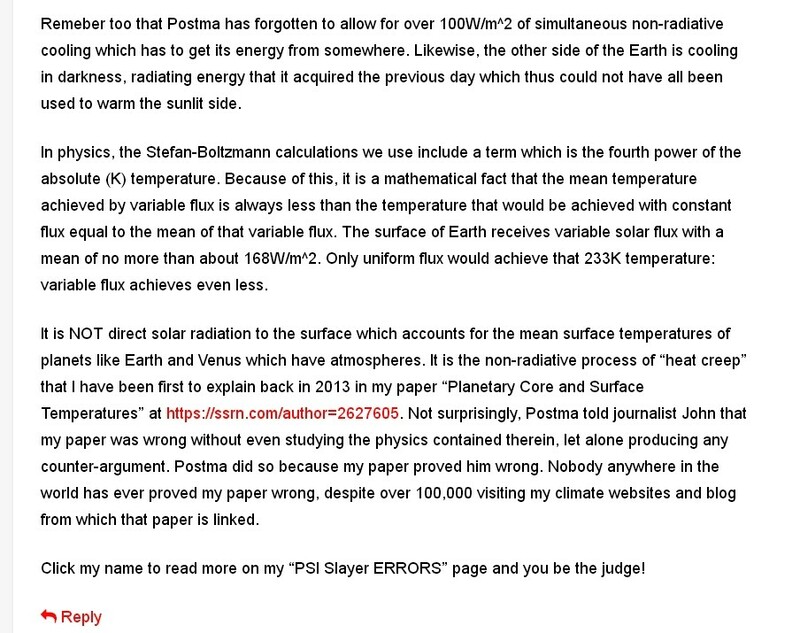 And so, in this context and with this breakthrough in understanding of climate, you will find errors in many climate blogs wherever they imply carbon dioxide warms. Please now read the "Evidence" page and view my 15-minute VIDEO. 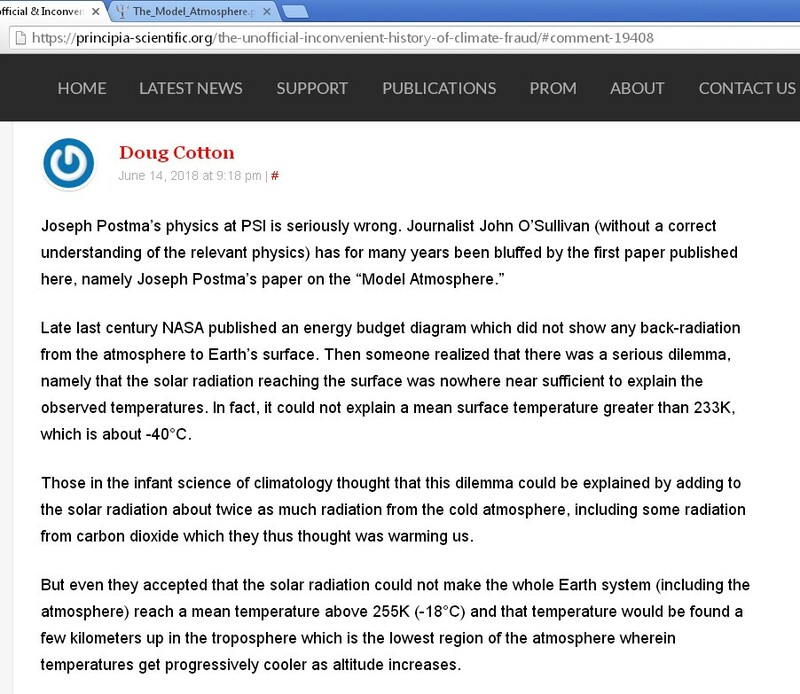 EXPERIMENT with CENTRIFUGE MACHINE REFUTES the RADIATIVE GREENHOUSE HYPOTHESIS. 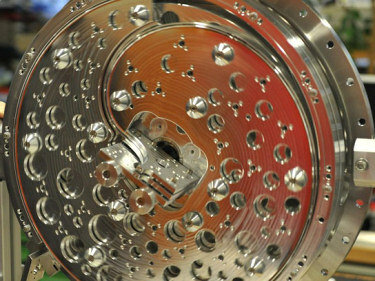 The strange looking machine at the right is a centrifuge machine recently invented so as to produce a gas stream at -272°C which is about 1°K, that is, only one degree above absolute zero. This experiment proves that a centrifugal force field creates a temperature gradient, and so too does gravity in the lower layer of the atmosphere which is called the troposphere. 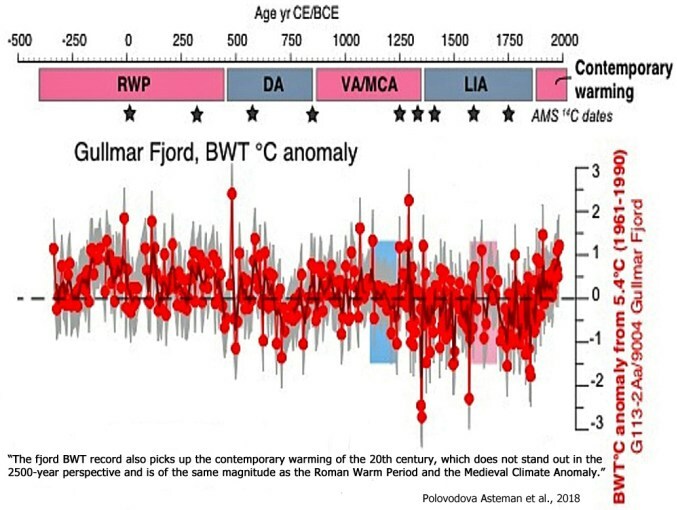 But those who postulated that so-called greenhouse gases like water vapor, carbon dioxide and methane raise the surface temperature assumed the temperature would be the same at all levels in the troposphere if there were no greenhouse gases. 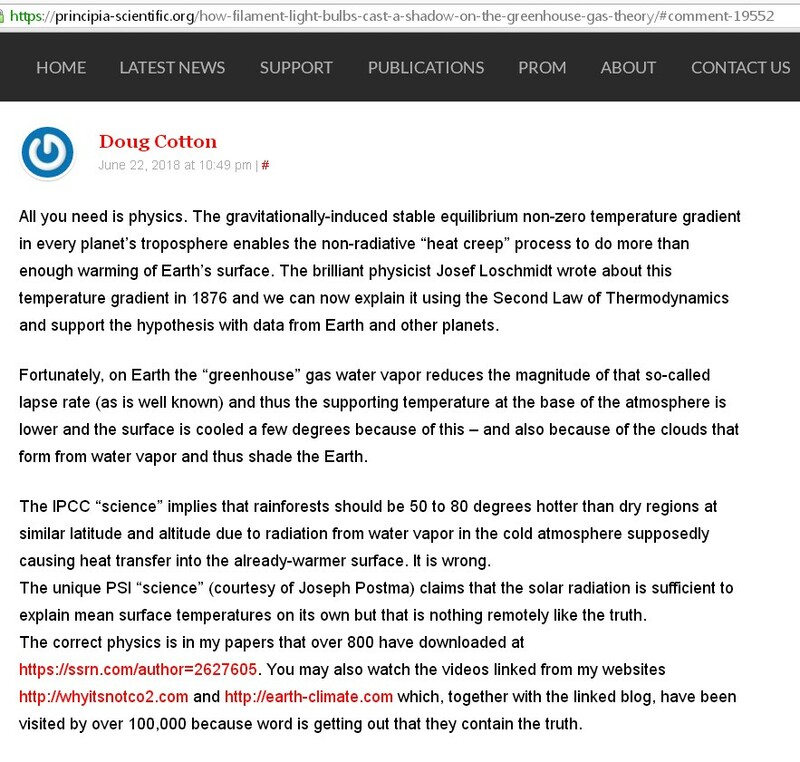 Many climate blogs promote the views of the owner as to whether or not, or by how much carbon dioxide might affect Earth's surface temperature. But this compelling evidence proves it has no effect. 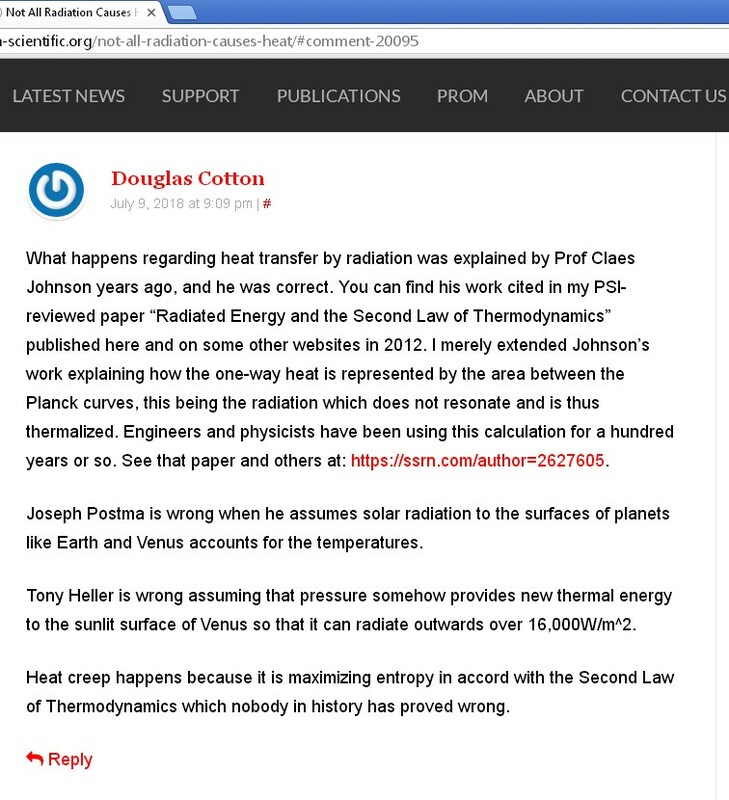 In the book Why It's Not Carbon Dioxide After All and my paper I explain the real physics of climate based on the Second Law of Thermodynamics and the associated state of thermodynamic equilibrium which that law says will evolve. 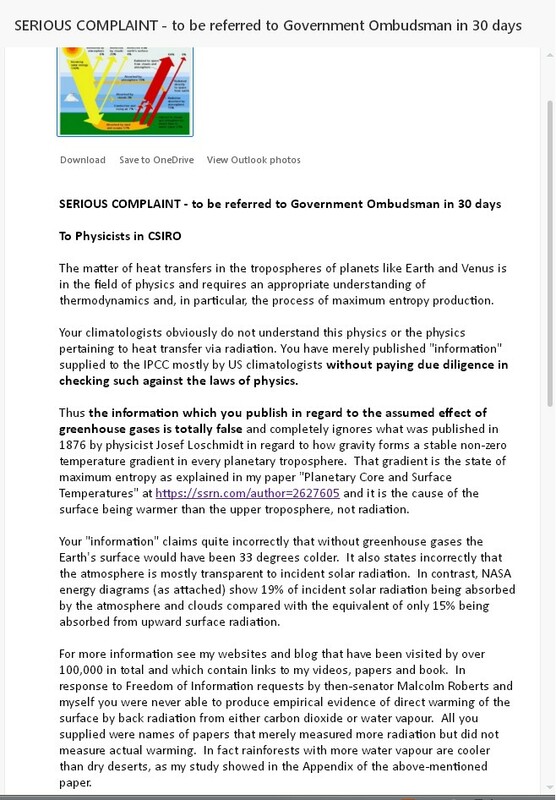 The overall level of Earth's surface temperatures is set by solar radiation and also cosmic ray levels, as these can affect cloud formation. There are natural long and short term cycles which are clearly evident in the climate records. There is a very interesting strong correlation between the climate cycles and the 934-year and superimposed 60-year cycles in the above plot which is derived from planetary orbits. For those who are interested it is the inverted plot of the scalar sum of the angular momentum of the Sun and all the planets. Magnetic fields from the planets may affect solar activity and cosmic rays. 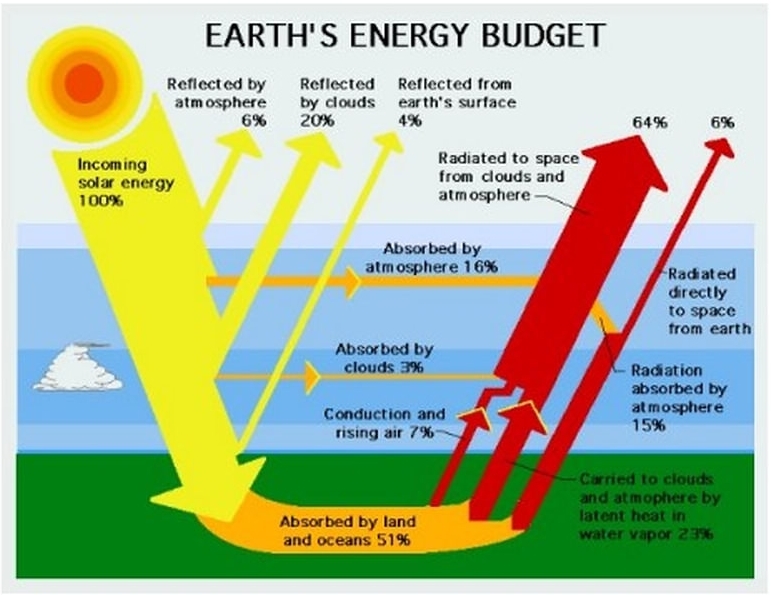 The whole Earth+atmosphere comes into radiative balance with the Sun at a temperature which is about 18 degrees below the freezing point of water. This is an average temperature and is typical of temperatures found about 4Km to 5Km above the surface. This is nearly half way up the troposphere, which is the region which contains most of the air in the atmosphere and gets colder by about 7 degrees with each 1Km increase in altitude. 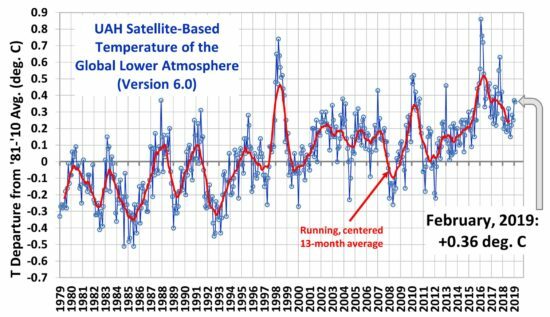 ​But what has baffled climatologists such as Dr James Hansen is the fact that the average (mean) surface temperature is of course warmer than that and may be around 14 to 15 degrees above freezing point, that being about 33 degrees warmer than the effective radiating temperature. 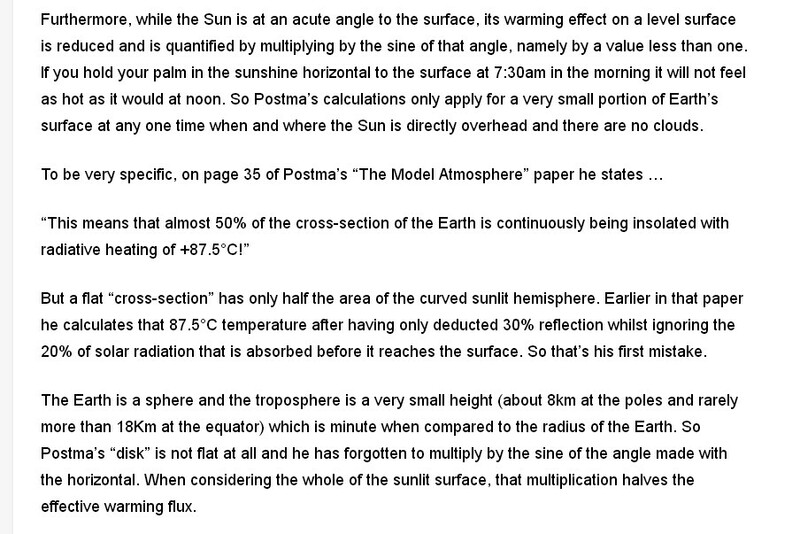 You might well think that the Sun can warm the surface to the observed temperatures with its direct radiation. 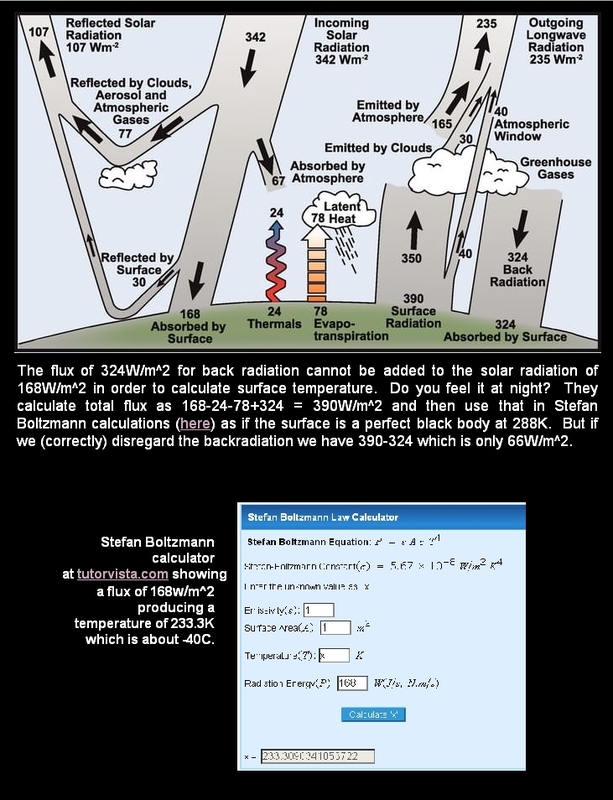 However, when we consider the whole globe and the average intensity of the Sun's radiation, the amount of cloud cover and the incident radiation absorbed by the atmosphere, the laws of physics tell us that the remaining solar radiation just simply is not enough. You are familiar with this diffusion process which can be observed if your car is left in the Sun and then driven into your garage. Close the garage door and open the car doors and gradually you will feel the temperature of the air in the garage warming and that of the air in the car cooling. This plot is derived from planetary orbits. 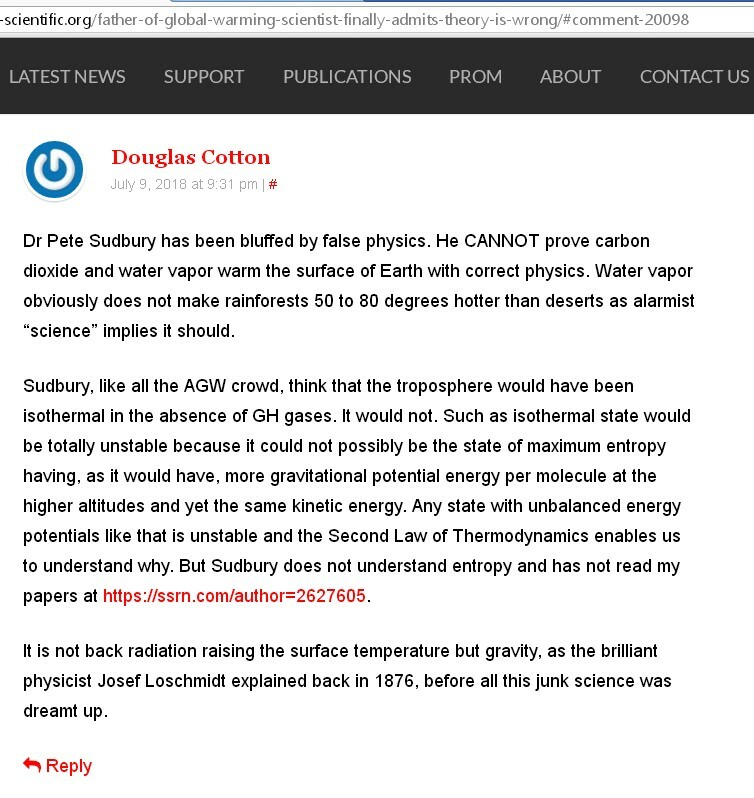 "maximum around 2050...next Little-Ice-Age around 2400"
Climate blogs, notably those run by Anthony Watts, Judith Curry and Roy Spencer are operated by people without a correct understanding of the physics pertaining to climate change. 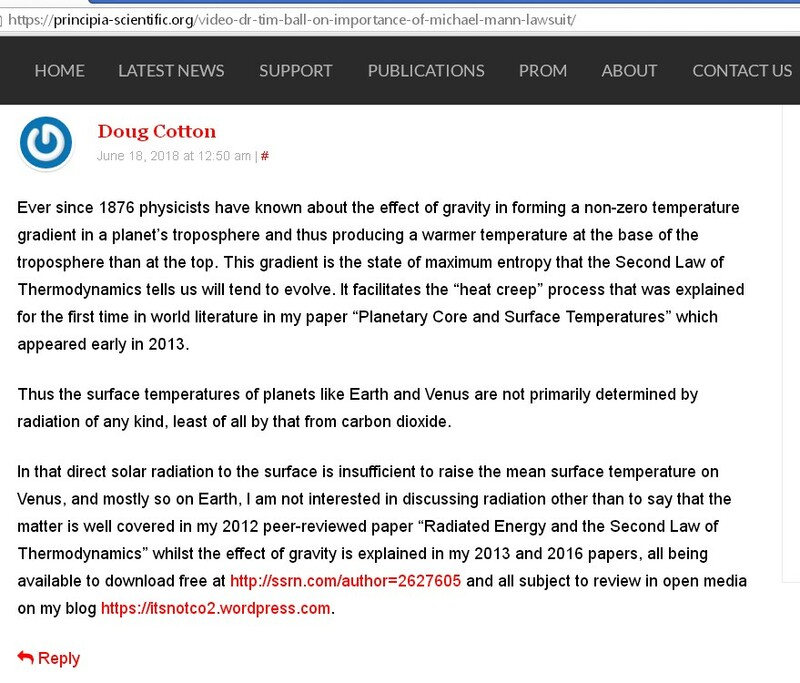 Their "Lukewarm" stance in effect endorses the false IPCC and NASA claims about radiative forcing. 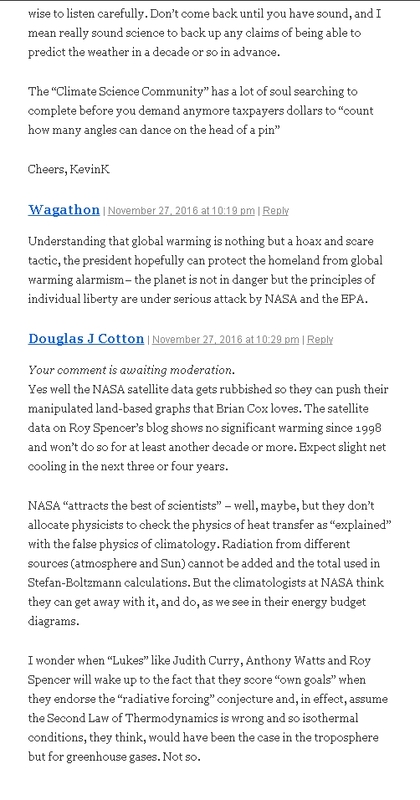 But, since they have a vested interest in the AGW "science" they simply delete comments by those like myself who don't agree with their opinion. Anthony Watts has banned many, and when he dedicated a post to his attempts to smear me, it backfired on him with some supporting my right to post and not be banned for life regardless. At the right is a screen capture here on Judith Curry's thread. Any questions and comments may be posted on my blog. 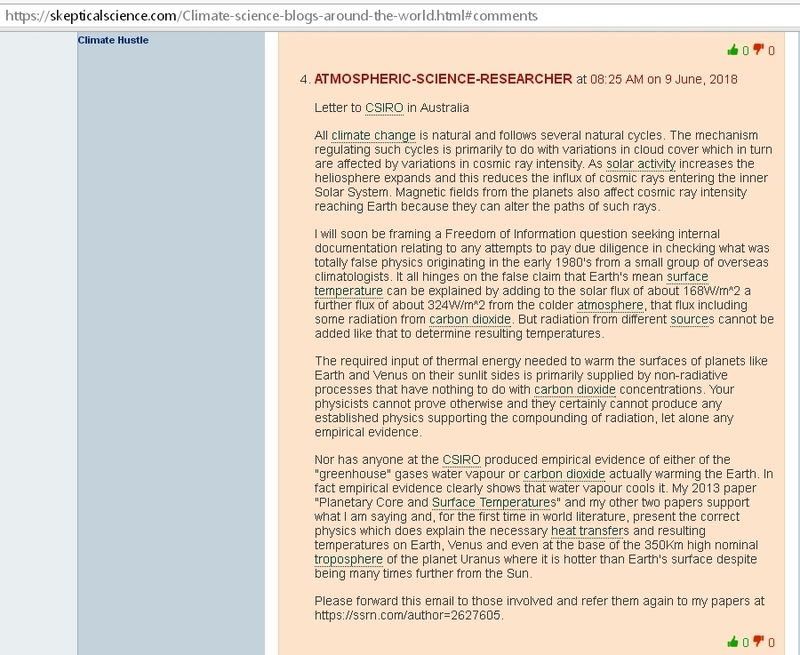 Complaint to CSIRO: click here. Click for 15 min. VIDEO!